3 Simple Reasons Why You Shouldn’t Call Yourself An Aspiring Writer Again. I know that it is good to be humble. It is safer in the early stages of development to declare yourself as a budding photographer, an aspiring inspirational speaker, a potential artist or up-and-coming writer. The only danger here is that when you say this to yourself for too long, you may never stretch to becoming the professional that you desire. Today, there are so many awesome tools to make your writing adventure fun, interesting and rewarding. One of such beautiful tool is Grammarly. On Grammarly, you will be able to check if your grammar in on point, confirm your spelling, proofread effortlessly and do much more. Sign up here to get started. Even if you haven’t tried all the tools in the world, but you can relate to one of the three points I described below, then you should stop calling yourself an aspiring writer. If your phone happens to have the short messaging service (SMS), and you have texted at least more than 50 times. I want you to do a simple math, 50 multiplied by 160 characters equals 8000 characters. That is more than 4 pages in Microsoft word. Do you realize that those 4 pages can become a product that can make your ideas spread and generate for you some money? Dear, You are an author! You have an account on twitter and you have written up to 500 tweets. On Twitter, I did a simple math. A few month ago, I noticed that I have tweeted 15,000 times, multiplied by 100 characters (on average) equals 1500000 characters. Isn’t that worth a mini-book, a product that can also pay some bills? You have a facebook account and have written at least 40 posts in the last 2 years. On Facebook, sum it up. Your status updates, comments on other people’s wall, birthday wishes, conversation in groups, Facebook chat and so on. How many words do you think you must have written in the last 3 years? Dear. You are an author! Most of us that are active and partially active on social media are authors. You are a creator. Talk less of some more social media platforms where you write and chat for countless hours. On WhatsApp, Badoo, Snaptu, BBM, WeChat, and online forum. Don’t wait to be commended or appreciated for what you write, say or do. Love the awesome you, get past the garbage. You’re creating every second and you don’t have to be a pro to click on publish. Keep writing and keep learning. Hey, don’t box yourself. Meaningful means many things to many people. Your ‘rubbish’ is what someone is hungry for. Be meaningful and useful to your tribe. Sometimes, our nonsense eventually makes sense. So, don’t wait to have everything figured out. You can start learning how to do just that today. 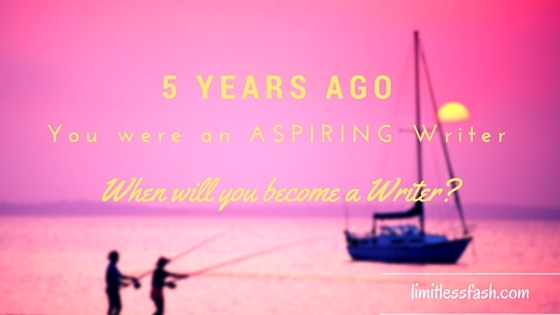 Are you still an aspiring writer? What is making writing seem like hard work for you? Go to the comment box, write it out your struggles. late, yet I never discovered any interesting article like yours. Thank you for your generous comment. I am happy that this was a good read for you. I have decided to serve some of my best work to the public and not just dish out blog post just to fill up the web space. I will like to know more about you and your work. What’s up, this weekend is pleasant in favor of me, for the reason that this moment i am reading this wonderful educational piece of writing here at my residence. Thank you, Estella, for reading. Thank you, Margareta, for reading and leaving a comment. Hearty Cheers and do have a great week ahead.